Concetta Barbera first appears in the Painesville, Ohio, area in 1913. In America, Concetta Barbaera was known as Carolina Inchiostro. Concetta Barbera, daughter of Salvatore Barbera and Maria Seggio, was born on June 20, 1879, at Palermo, Sicily. She married Gaetano Inchiostro, son of Giocchino and Giovanna Inchiostro in 1900 at Italy. Concetta died on December 1, 1937, at her home, 349 Owego Street, Painesville, Lake County, Ohio, at age 58, of cerebral apoplexy. Her body was interred at St. Mary Cemetery at Painesville Township, Lake County, Ohio. Concetta Barbera, age 33, immigrated to the United States on November 15, 1912. She was probably travelling with her daughter, Maria, and son, Salvatore. Their destination was probably McKeesport, Pennsylvania (joining Concetta’s husband, Gaetano Inchiostro). Three of Carmella’s sisters also lived in Painesville. Rosa (Profeta) moved to Painesville in 1909. Camella (Seggio) in 1914. Giovanna (Dellaria) came to Painesville in 1921. 1. Gioacchino Inchiostro was born on March 29, 1902, at Palermo, Sicily. Gioacchino died on January 1, 1991, at Michigan at age 88. 2. Maria Inchiostro was born on February 7, 1904, at Caltagirone, Sicily. She married Salvatore Seggio, son of Salvatore Seggio and Carmella Barbera. Maria died in December, 1991, at age 87. 3. Salvatore Inchiostro was born on August 25, 1910, at Caltagirone, Sicily, Italy. Salvatore died on March 1, 2000, at Michigan at age 89. 4. Angelo Inck was born on April 25, 1914, at Ohio. Angelo died on March 11, 2001, at age 86. 5. Jennie Inchiostro was born on April 25, 1914, at Ohio. She married Bert Dilday. Jennie died on April 13, 1995, at age 80. Her body was interred at Riverside Cemetery at Painesville, Lake County, Ohio. 6. 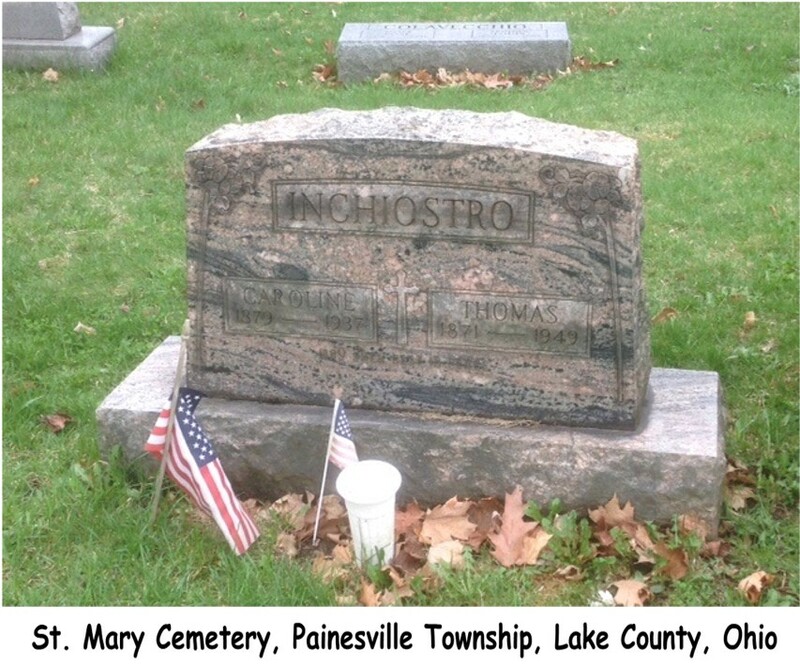 Concetta Inchiostro was born on June 12, 1915, at Painesville, Lake County, Ohio. She married Dominic A. Juist, son of Feliceantonio Giusti and Armonia Lombardi. Concetta died on October 7, 2006, at Madison Health Center, Madison, Lake County, Ohio, at age 91. Her body was interred at Riverside Cemetery at Painesville, Lake County, Ohio. 7. Josephine Elizabeth Inchiostro was born on November 26, 1916, at Painesville, Lake County, Ohio. She married first, Andrew Robert Komniey. She married second, Roy Sidley. Josephine died on January 15, 2009, at Mentor Way Care Center, Mentor, Lake County, Ohio, at age 92. Her body was interred at Riverside Cemetery at Painesville, Lake County, Ohio. 8. Adeline M. Inchiostro was born on November 23, 1918, at Painesville, Lake County, Ohio. She married Anthony D. Tripi. Adeline died on February 4, 2005, at Lake Med Rehab Center, Painesville, Lake County, Ohio, at age 86. Her body was interred at Riverside Cemetery at Painesville, Lake County, Ohio.